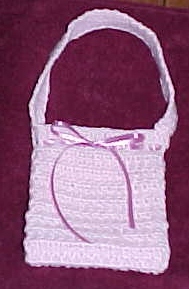 I designed this purse for my little girl to carry for Easter. ROW 1: Ch 32, hdc in 3rd ch from the hk and in each rem ch across (31 dc). Ch 2, turn. ROW 2: * Hdc in bl only of next hdc, hdc in fl only of next hdc. Repeat from * across to last 2 sts, hdc in bl only of next hdc, hdc in both lps of last hdc. Ch 2, turn. ROWS 3-33: Repeat Row 2. ROW 34: Hdc in both lps of each hdc, ch 1 at the end of row. DO NOT FASTEN OFF. RND 1: Join yarn in a st at the side of the purse (near the seam), ch 4, dc in next st, * Ch 1, sk next st, dc in next st. Repeat from * around. Join with sl st in 3rd ch of beg ch 4. RND 2: Sl st in next ch 1 sp. Ch 3, * dc in next dc, dc in next ch 1 sp. Repeat from * around. Join with sl st in top of beg ch 3. DO NOT FASTEN OFF. HANDLE: Sl st in next dc, ch 1, turn. Sc in same st as ch 1, sc in next 5 sts. (the handle should be centered on the side of the purse)* Ch 1, turn, sc in each sc. Repeat from * till handle is desired length. Join handle to opposite side of purse with sl sts being sure the seam is on the inside of the purse and that the handle is centered on the side of the purse. FINISHING TOUCH: WEAVE A RIBBON THROUGH THE OPEN DC RND (RND 1) AND TIE A BOW IN THE FRONT.